We loyal fashion followers look to the September issue of all the major magazines – yes, 995-plus pages – for the new look: that cool, crisp breath of fresh air, the current vibe and the pulse on what is ooohing and aaahing even the most frigid of fashion dictators. Summer and spring are playful and fun, but fall and winter are the seasons that inspire. They beckon us to layer, to cuddle up in shearling and fur, to pull on our big-girl boots and wrap up our once exposed necks in cashmere scarves. I took some time this week to look at fall's most refreshing trends, and here are a few of my favorite ones – not to sound too much like Julie Andrews… A dainty shoe made for a lady – no platforms here (Jim, my beau and previous feature in Street Fashionista, used to make the meh-face when I would come home with ho-shoes). Pattern play – mixing unsuspecting prints together creating a super cool, cool-girl vibe, kind of like oh-ya-I-found-this-on-the-floor-and-threw-it-on, very je ne sais quoi. Adding a fur collar to everything, yes I mean everything – your leather jacket, your denim jacket, a pullover sweater, your grandma's pajama set, everything. Tuxedos – for the ladies, very "Victor Vicotria" since I'm on a Julie Andrews kick. Distressed denim jeans with black opaque tights and hats – yes, still hats – but no floppy ones, only clean lines, sharp lines, dignified. Guys, a tailored look is upon you. Tuck in your shirt, wear a jacket that fits, try a pocket square, shine your shoes, comb your hair, and for the love of this green earth, pull up your pants. Us dames want a gentleman this fall. Where? Tinseltown at the viewing of "Scatter My Ashes at Bergdorf's"
Why Terese'? I was standing in front of the theater looking for the girl whose spirit struck me. I found no one, so back in I went to watch the show. Eureka! Right in front of me was Terese', a freshman beginning Mercyhurst's fashion program this year, and she is beyond excited. 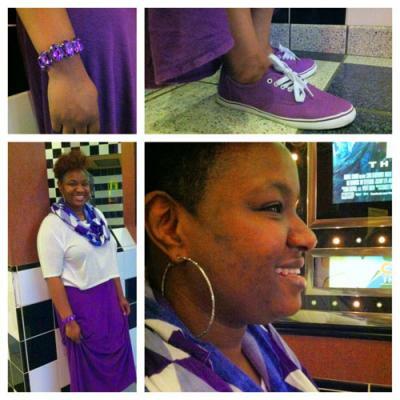 I love her purple maxi skirt and purple kicks – so cute. I hope you have the best year, Terese' – good luck! Describe your style. Who is your fashion icon? I am all about blending different styles, trends, and fashions into my wardrobe to create a very urban-chic eclectic look. I don't have icons, but I do like the styles of Rihanna and Beyonce. I am really into to music so I really look at what the musicians are wearing and what fashions they are into. If you could have lunch with any designer past or present with whom would you dine? I would have lunch with Christian Louboutin. I love shoes, and I would love to have just one pair of Louboutins in my closet! Best fashion advice ever given to you. "Don't go by sizes; go by the way it fits your body!" What are you most excited to study in Mercyhurst University's fashion program? What are your top 5 favorite trends? Pencil skirts, pointy stilettos, sheer blouses, animal prints, and printed jeans. What is your go-to store in Erie for that great find? And your favorite online store? It's Charlotte Russe...I love their clothes! Shoedazzle.com...They have the prettiest and flyest shoes!! Top 3 favorite blogger sites. I don't look to blog sites for styling. I get a lot of my inspiration and advice from magazines (like People's Stylewatch), my mom, and just by observing other people's fashion sense! Tell me why you love purple. I have always been attracted to the color. It is just a beautiful color that is associated with wisdom, dignity, and independence – qualities that I feel represent me! Describe your favorite decade for fashion. I like Ancient Egyptian fashion, like Queen Nefertiti and Cleopatra. If you had $1,000 what would you buy right now? Shoes, shoes, shoes and more shoes....I love shoes!!! Find me out on the town and challenge yourself to get noticed by the Erie Reader! Leslie McAllister can be contacted at lMcAllister@ErieReader.com, and you can follow her on Twitter @ShopJuJus. Festival fashion is all about creating a funky, boho look that you could rarely get away with on a typical day. Tips for shopping, punching up your work look, and accessories you can't live without. Meet Lili: Blogger, resident fashionista, and stylist for Keaton Row. Erie, get to know your first blow-dry bar. Fashion... It's a family affair.